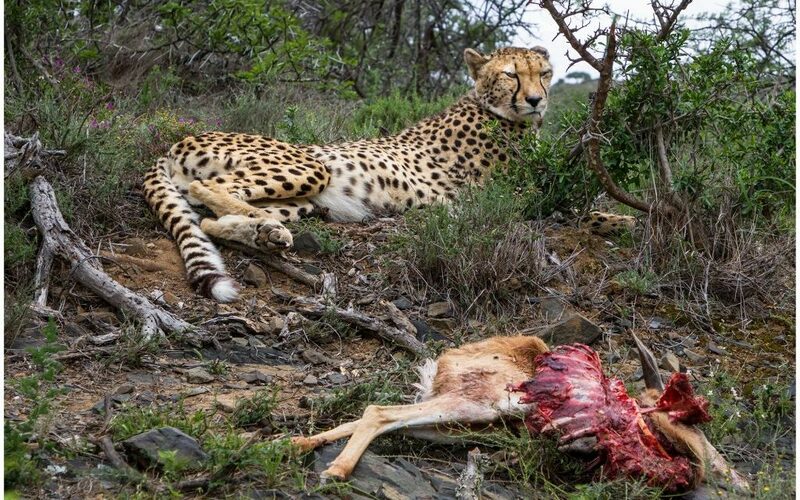 The conservation team at Kuzuko Lodge, managed by Legacy Hotels and Resorts, are happy to report that the captive bred cheetah named Jasmin, which was donated to Kuzuko by the NPO Ashia Cheetah Conservation, was recently released into a larger holding camp and has officially made her own kill. The significance of this is a critical piece of a carefully constructed conservation puzzle that brings her closer to being released into the wild. Jasmin, who arrived at Kuzuko Lodge on 29th of August 2018, was initially kept in a smaller holding boma to acclimatise, thereafter she underwent a soft release into a 300ha camp on the 27th of September. Upon her release she picked up the food that had been provided to her in the boma, carried it 20m, dropped it and started looking for animals to hunt. “That very afternoon she was seen chasing impala and we were surprised by her speed, especially considering she has been raised in captivity,” says Gerhard de Lange, Kuzuko Reserve General Manager. “During the next couple of days, she was regularly seen chasing springbok, steenbok and meerkats. “She made her first springbok kill on Friday the 5th of October, a mere eight days after her release out of the holding boma. Unfortunately I was not on the property at the time to document it, and it was in a river line. Knowing that there are other animals around this area that could present a danger to people on foot, my team could not photograph it. But we knew that it would only be a matter of time until she killed again, and we could document it for the public to see,” adds De Lange. It was on Monday the 15th of October, that De Lange then found her hunting in the North-Eastern corner of her camp, but lost visibility of her when she entered a densely vegetated area. At 17h00 that afternoon he decided to follow her radio collar signal and started walking in its direction when he came around a corner and there she was, on another springbok kill. “I rushed back to the vehicle to collect camera equipment to photograph and film this milestone to share with everyone in South Africa who has been following Jasmin’s story. We also had a number of foreign tourists out on the game drive with us that afternoon, who our qualified field guides then took within a safe distance of the site to also experience this incredible feat of Mother Nature. It’s an unbelievable journey we are on and to be able to share this wilding process with people who can take the story of Jasmin home with them, and share with hundreds more, is what conservation is all about,” he adds. With this milestone, the process of wilding Jasmin is well and truly on track and according to the Kuzuko team is “going better than expected”. While De Lange says she still has a way to go to build her full strength, it is important to embrace and celebrate the unbelievable success of her being able to hunt, on her own, for the first time in her life. As a result of the speed at which she has accomplished this she could very well join the two males out on the 15 000ha Kuzuko Reserve sooner than expected. “The cheetah has become Africa’s most endangered big cat. From a count of 100 000 in 1900, the numbers have dropped to under 7 000 today. Ethical breeding in captivity, such as that we are working on at Ashia Cheetah Conservation, has become essential to ensure the long-term survival and viable genetic diversity of the species. The release of Jasmin, a captive-born cheetah, into the wild – the first of many to come for Ashia – who is now proving our efforts right through her successes, is a true win for conservation on numerous fronts. A large part of this achievement has been the successful collaboration between the various stakeholders involved,” says Chantal Rischard, co-founder at Ashia Cheetah Conservation. Like Jasmin, further captive-born cheetahs will be released into the protected wild within selected Private Game Reserves in South Africa through Ashia’s Release Programme. According to Rischard, several potential game reserves have already been identified and visited by the Ashia team and are in the process of applying for the necessary permits. “I often get asked why does this matter? 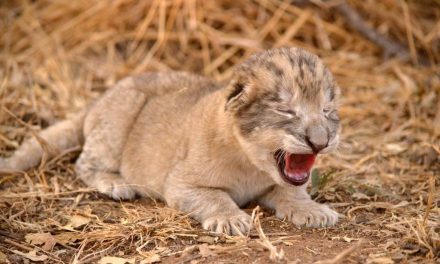 It’s a huge step for conservation, as a community we need to pool together and help our big cats by diversifying their gene pool in order to ensure the longevity of the species. Jasmin’s DNA, which we have on record, doesn’t have the same structure than the cheetahs in the existing metapopulation, and indicates that she is in fact closely related to captive animals. Therefore, breeding her with existing wild males will create a diversified genepool that can only benefit the cheetah metapopulation,” states De Lange. “From our side, Kuzuko Lodge must thank NPO Ashia Cheetah Conservation for trusting us with the first wilding process of a captive bred cheetah from its programme. Jasmin will, and is, opening doors for many other captive bred cheetahs to be wilded in suitable areas, and will ultimately secure a more genetically viable wild cheetah population,” ends De Lange.